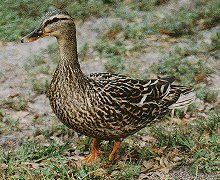 Mallards are dabbling ducks found in wetlands statewide. The drake displaying his curled tail feathers and blue speculum. The hen's plumage isn't flashy but serves her well. A drake in a familiar pose.